I don’t even have any pictures I’ve been so tired and busy, so you’ll just have to believe me. The last 5 weeks have been the hardest thing I’ve ever done. By far. IMC was tough, I’d argue that finishing Boston was tougher, and then there are the private and personal struggles we all go through that are a different kind of challenge than anything physical. I can easily say though, that the last 5 weeks of training, my build to peak, were the hardest thing I’ve ever done: 5 weeks of steady building (training mileage + hours) with a finale weekend of a 128 mile ride + hour-long run on Saturday, and a 20 mile run on Sunday. With a taperless 70.3 and a 3-day training camp in the middle, no less. Ever single day for the last 5 weeks I’ve woken up more tired. It can’t get harder than this, tomorrow you’ll feel better, I’d tell myself multiple times per day. You just need to warm up, I’d tell myself to limit discouragement at the start of each workout. You should be tired, as I got sleepy earlier and earlier each night. I watched my Garmin and fought to keep pace, and watched my heart rate drop drop drop. By the end I couldn’t get it above zone 3b if a tiger were chasing me. There were a few days, specifically in the last 2 weeks, where I truly didn’t know if I could finish my workout. Not because I didn’t want to, but because I didn’t know if I was capable. Spoiler: I did. But had coaches and friends not surrounded me the first day of camp, or had I not had others to meet and keep me entertained for a 7+ hour ride (that started with 2-3 hours of rain! ), I don’t know if I could have blocked out the mountain of a day and focused on moving one mile at a time. Even though it was only 2 days after the peak of my training, yesterday I woke up feeling better. To say I felt “good” would be a laughable overstatement, but better than I’ve felt for at least a month. Even if my body hasn’t gotten the memo, my brain knows: Taper Has Arrived! I feel grateful to have arrived at taper in one piece this year. I feel happy that I held it together and didn’t have a mid-build meltdown like I usually do (nevermind some exceptionally grumpy days – no tears is an incredible feat!). I am proud that I worked so hard every single day. At this point, I couldn’t panic train if I tried. There is nothing left, I am empty, and my tank needs to refill itself. But I believe that I did everything I could this year. I know I did. I will always wish to be faster, and fitter. But all you can do is give each day your whole body and heart, and I did that a hundred times over. With about 40 miles to go (of 128) of our last long bike ride on Saturday we started talking about how we were heading home. Well, unless any of get to Kona this year. Countdown begins the moment I cross the NYCM finish line next Sunday. Bob, you are right. This IS Ironman Canada. But I wanted to make sure that when I need to read this 800x next August or September for inspiration and a reality check, just like I read it 800x before this year’s race, I can find it. Right now you’ve all entered the taper. Perhaps you’ve been at this a few months, perhaps you’ve been at this a few years. For some of you this is your first IM, for others, a long-overdue welcome back to a race that few can match. You’ve been following your schedule to the letter. You’ve been piling on the mileage, piling up the laundry, and getting a set of tan lines that will take until November to erase. Long rides were followed by long runs, which both were preceeded by long swims, all of which were followed by recovery naps that were longer than you slept for any given night during college. You have survived the Darwinian progression that is an Ironman summer, and now the hardest days are behind you. Like a climber in the Tour de France coming over the summit of the penultimate climb on an alpine stage, you’ve already covered so much ground…there’s just one more climb to go. You shift up, you take a drink, you zip up the jersey; the descent lays before you…and it will be a fast one. Time that used to be filled with never-ending work will now be filling with silent muscles, taking their final, well-earned rest. While this taper is something your body desperately needs, Your mind, cast off to the background for so very long, will start to speak to you. January, long rides in April, and long swims every damn weekend will be worth it. It comes from getting on the bike, day in, day out. It comes from long, solo runs. From that first long run where you wondered, “How will I ever be ready?” to the last long run where you smiled to yourself with one mile to go…knowing that you’d found the answer. You will walk into the lagoon on August 26th with 2000 other wide-open sets of eyes. You will look upon the sea of humanity, and know that you belong. You’ll feel the chill of the water crawl into your wetsuit, and shiver like everyone else, but smile because the day you have waited for for so VERY long is finally here. The bagpipers will walk across the beach. Steve King will ask you to sing along. You will. Maranatha will roar. The splashing will surround you. The swim will be long – it’s long for everyone, but you’ll make it. You’ll watch as the Penticton Lakeside Hotel grows and grows, and soon you’ll hear the end. You’ll come up the beach and head for the wetsuit strippers. Three people will get that sucker off before you know what’s happening, then you’ll head for the bike. In the shadows on Main Street you’ll spin out of town – the voices, the cowbells, and the curb-to-curb chalk giving you a hero’s sendoff. You won’t wipe the smile off your face for miles as you whisk along the lakeside, past fully stocked, silent aid stations for the run to come. You’ll spin up McLean Creak Road. You’ll roll down towards Osoyoos, past the vineyards glowing in the morning sun. You’ll settle down to your race. The crowds will spread out on the road. You’ll soon be on your bike, eating your food on your schedule, controlling your Ironman. Richter Pass will come. Everyone talks about it, but it’s really nothing. You’ll know this halfway up, as you’re breathing easy and climbing smoothly. Look to your right. Look how high you’re climbing. Look at all the bikes below, still making their way there. You’re ahead of them. All of them. You’ll climb over Richter, and descend to the valley below. You’ll ride the rollers, one at a time. You’ll start to feel that morning sun turn to afternoon sun. It’s warmer now. Maybe it’s hot. Maybe you’re not feeling so good now. You’ll keep riding. You’ll keep drinking. You’ll keep moving. After all, this is just a long training day with valet parking and catering, right? You’ll put the rollers behind you. You’ll head into the Cawston out and back. You’ll put on your game face, fighting the urge to feel down as you ride the wrong way for what seems like hours. 10 miles in, you reach special needs, fuel up, and head out. By now it’ll be hot. You’ll be tired. Doubts will fight for your focus. Everyone struggles here. You’ve been on that bike for a few hours, and stopping would be nice, but you won’t – not here. Not today. You’ll ride on leaving Cawston behind you and head for the final showdown at Yellow Lake. You’ll grind the false flats to the climb. You’ll know you’re almost there. You’ll fight for every inch of road. You’ll make the turn towards the summit as the valley walls close in for the kill, and put your head down. The crowd will come back to you here – the cars are always waiting to cross the summit, and you’ll soon be surrounded in the glorious noise that is the final climb of Ironman Canada. Let their energy push you. Let them see your eyes. Smile when they cheer for you – your body will get just that little bit lighter. Just like that, you’ll be descending. 12 miles to go, and no climbing left. You’ll plunge down the road, swooping from corner to corner, chaining together the turns, tucking on the straights, letting your legs recover for the run to come – soon! You’ll roll back into town – you’ll see people running out. You’ll think to yourself, “Wasn’t I just here?” The noise will grow. The chalk dust will hang in the air – you’re back in Penticton, with only 26.2 miles to go. You’ll relax a little bit, knowing that even if you get a flat tire or something breaks here, you can run the damn bike into T2. You’ll take that first step of a thousand…and you’ll smile. You’ll know that the bike won’t let you down now – the race is down to your own two feet. The same crowd that cheered for you in the shadows of the morning will cheer for you in the brilliant sunshine of a Penticton summer Sunday. High-five people on the way out. Smile. Enjoy it. This is what you’ve worked for all year long. That first mile will feel great. So will the second. By mile 3, you probably won’t feel so good. You’ll make it to halfway at OK Falls. You’ll load up on special needs. Some of what you packed will look good, some won’t. Eat what looks good, toss the rest. Keep moving. Start looking for people you know. Cheer for people you don’t. You’re headed in – they’re not. They want to be where you are, just like you wanted to be when you saw all those fast people headed into town. Share some energy – you’ll get it right back. The miles will drag on. The brilliant Penticton sunshine will yawn, and head for the mountains behind the bike course…behind that last downhill you flew down all those hours ago. You’ll be coming up to those aid stations you passed when you started the bike…fully alive with people, music, and chicken soup. TAKE THE SOUP. Keep moving. …all you have to do is get there. You’ll start to hear town. People you can’t see in the twilight will cheer for you. They’ll call out your name. Smile and thank them. They were there when you left on the bike, and when you came back, when you left on the run, and now when you’ve come back. You’ll hit mile 25. You’ll turn onto Lakeside Drive. Your Ironman Canada will have 1.2 miles – just 2KM left in it. You’ll run. You’ll find your legs. You’ll fly. You won’t know how, but you will run. You’ll make the turn in front of the Sicamous in the dark, and head for home. The lights will grow brighter, brighter, and brighter. Soon you’ll be able to hear the music again. This time, it’ll be for keeps. You’ll listen for Steve King, or Mike Reilly, or Whit Raymond. Soon they’ll see you. Soon, everyone will see you. You’ll run towards the lights, between the fences, and into the nightsun made just for you. You’ll break the tape. The flash will go off. You will be an Ironman. In my heart of hearts I have mixed feelings about the Kona lottery situation and charity registrations for Boston. Even the ING NYC Marathon. I wouldn’t ever feel right about racing these prestigious races without earning my way into them. What is earning though… Working hard? Doing your best? Being better than someone else? Boston and NYC have qualification times, while Kona requires a certain spot on the podium (based on how large your age group participation is at your specific race). In either scenario there are so many factors that no one can control that affect your chances. Weather, course, who else is registered, how quickly you can get to your computer and enter your credit card number. Equal? No. Fair? Partially. Measurable. Yes. Still, though, I believe that I deserve it or I don’t, and that’s a decision I’ve made for myself. That said, there are people who will never qualify, for whatever reason, that have worked a hundred times harder than I have, who have overcome two hundred times as much, and who want it just the same, or dare I say more. Meet some of them at Ironman’s Kona Inspired contest, where athletes are applying via video for one of six Kona spots that Ironman is gifting to those who can illustrate best that Anything is Possible. I may not agree with the lottery or charity spots, but I do agree that Anything is Possible. For sure. 100%. For my most important meal of the day today I did not have peanut butter toast with bananas. Quelle Horreur! However, I did have a special guest. Yeah, that’s right. Macca joined me for a bowl of Wheaties Fuel. I’ll admit that it wasn’t as delicious as my usual, but the company was very inspiring. Such an impressive lady. Not only is she an incredible athlete, she’s a good human that wants to good things for others and the world. 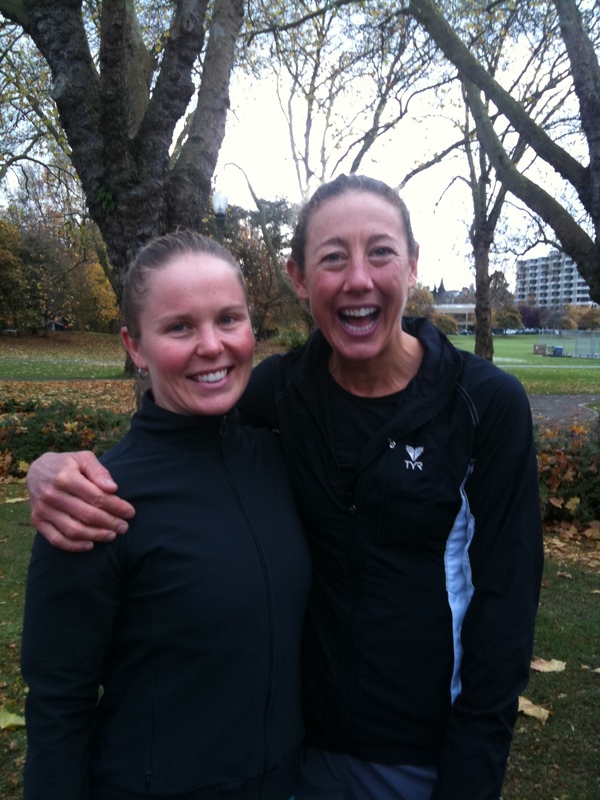 Hopefully some of her awesomeness rubbed off on me during the group jaunt around Green Lake today. In other news, I’m not as nice as Chrissie is. There were some CRAZY superfans out there and I judged them for being batshit crazy. Yes, I did. But being witness to their insanity was pretty entertaining. Sometimes I’m pretty impressed with you. I think about how much you hated running, even just as cross training, growing up. During conditioning you always plotted your turn to sprint while coaches were watching someone else (thus being too preoccupied to yell FASTER!). I think about how you have asthma, but don’t let it stop you. I think about how many mornings the “tiredness” or “fatigue” was probably a hangover, but you ran anyway. I reminisce about how many times you wanted pizza and ice cream for dinner, and made it so. Well, that one doesn’t work. But truly. 6 months ago you had never swam in open water. 7 months ago you hadn’t ridden a bike in about 15 years (minus a jaunt around Stanley Park, twice). 1 year ago you qualified for Boston, and that was enough at the time. 2 years ago you hadn’t swam laps as exercise since childhood. 1 year ago you started only because running with a stress fracture was no longer an option. 3 years ago you trained worked out only to burn off calories consumed at the bar the night before. 3.5 years ago you and running had just been introduced, but weren’t yet friends. It’s easier to keep going when you can remember the progress you’ve made, so drink it in. Take it while you can get it, because there will certainly be greater challenges around the bend. You’ve already jumped from celebrating these victories to feeling unsettled if you miss your splits by seconds or if weights feel harder than they “should”, no matter what the reason. You recently edited an early blog post regarding Kona because you had lied. You most certainly do want to get there, are willing to do the work, and now aren’t afraid to say it out loud tell the interwebs anymore. Keep dreaming of Ali’i Drive, but slow down and savor now, too. To get there, you’ll have to make all of your moments happening right now count. Self, remember to be lighthearted. Laugh at the time you thought you were only supposed to swim with one fin. Learn from the race where you doggie paddled a significant portion of the swim. Look back on winter morning runs with frozen fingers and toes, and smile. Be grateful for the people you’ve met and the friends you’ve made, and use them as inspiration. Thank your body for following suit in what you ask of it. Love every second that you are given the opportunity to work hard and be better. 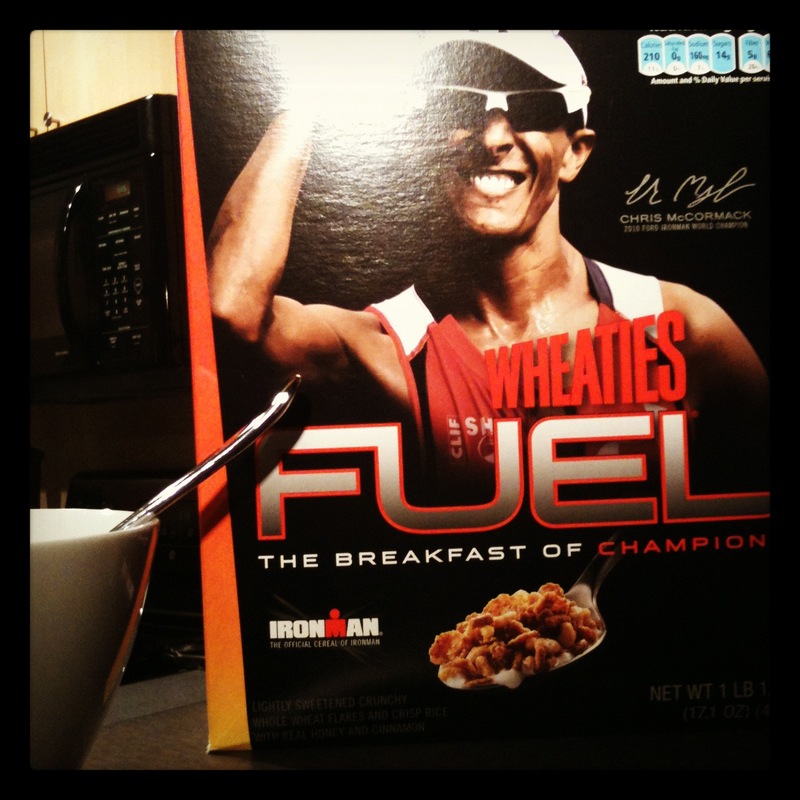 Savor early mornings, late nights, and every container of peanut butter than you are going to experience along the way. Thank goodness for the peanut butter. I’m sort of kicking myself right now, as I sit here in Hawaii, for not better planning our trip. We’re lucky to be here, but how awesome would it have been to extend it for an additional weekend out on the big island for the big event, the Ironman World Championships? Answer: It would have been awesome. Very very awesome. I’m not set on making Kona a mandatory part of my triathlon resume, but I would have loved to support and cheer those on that have made getting there their entire life. Because that’s what it takes; whether you are a pro or an age grouper it’s competitive, and to get to Kona you have to make both qualifying and training for that one day your.whole.life. I’m pretty dedicated, and fit into the 100%-all-in-or-won’t-play-at-all category of person, but Kona. Deep breath. It’s so inspiring to feel part of something that special and big though, an event that means a lot to everyone but that at the same time means something huge but different to every single person racing. I’ve put my internet stalking capabilities to good use and am currently following most of the pro’s and products that are in Kona on Twitter. It’s been a really fun way to learn how things work and what happens over there. What’s the underpants run, you ask? Who has heard of a beer brand as an “official” recovery sponsor? Where do lots of athletes stay (no, I won’t be in-person stalking)? Much of the information I’m learning is inconsequential, but it’s fun to know about and feel not so far from. I know, I know, “Welcome to the twittersphere newbie.” It’s such a good way to learn from afar though, especially when you are a listener before a doer, like me.